Sunny. High 91F. Winds SW at 15 to 25 mph. Winds could occasionally gust over 40 mph..
A clear sky. Low 58F. Winds SSE at 10 to 15 mph. 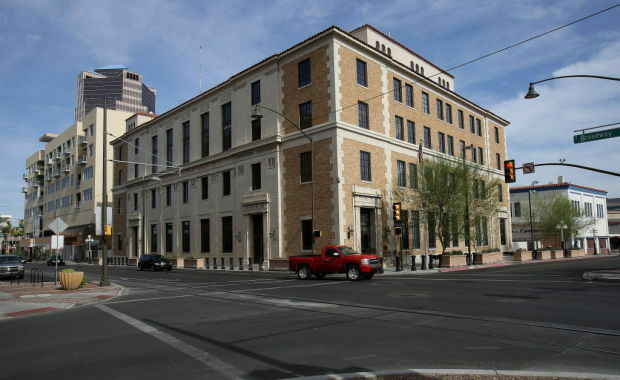 The Bankruptcy Court’s Tucson division is housed in the James A. Walsh U.S. Courthouse downtown. Bankruptcy filings rose nearly 5 percent in Southern Arizona and 3 percent statewide in 2018, increasing for the second year in a row, according to the latest figures from the U.S. Bankruptcy Court’s Arizona district. Last year, 3,904 bankruptcy cases of all types were filed in the court’s Tucson division compared with 3,733 in 2017, a 4.6 percent increase. Statewide, the overall number of filings rose 3 percent from 2017, to 15,742. The court’s Phoenix division reported a 2.1 percent increase and the Yuma division posted an 8 percent increase. Though full-year nationwide filing statistics for 2018 were not yet available, the U.S. Bankruptcy Court said filings for the first half of the year were down 2.6 percent. In 2017, bankruptcy filings rose nearly 9 percent in Southern Arizona and more than 4 percent across Arizona, after falling by double-digit percentages every year since 2010. Tucson filings under Chapter 11 of the U.S. Bankruptcy Code, used mainly by businesses to protect them from creditors while they restructure their debt, fell 22.6 percent last year to 24. Most were real-estate related. The Tucson bankruptcy division processes filings from Pima, Pinal, Cochise, Santa Cruz, Graham and Greenlee counties. Filings in Tucson under Chapter 7, which calls for the liquidation of assets to pay creditors, rose 6.1 percent, slightly more than the 2017 increase. Tucson cases filed under Chapter 13 — which entail debt-restructuring plans for individuals — rose less than 1 percent to 865, according to court data. Though Arizona bankruptcy filings increased last year, they are still far below their peak in 2010, when in the wake of the Great Recession nearly 41,600 cases were filed statewide and more than 8,000 were filed in the Tucson court. The East Broadway Kmart store opened in 1970; Sears at Tucson Mall unaffected for now.